THE pale, half-light of dawn revealed Og crouched among the rocks back from the edge of the cliffs above the river. Alert, muscles tensed, with dark, heavy brows drawn down, he watched the black opening of a cave hidden among the boulders a little distance away. Already strung, with arrow nocked, he gripped his stout bow in his big left fist while the thick fingers of his right hand gripped the string. The bow was unflexed but the ready attitude of the cave man bespoke the fact that his weapon could be quickly drawn to its full power and released in the wink of an eye, sending a flint tipped shaft leaping away under full power straight for the enemy he was awaiting. Said enemy was a big, powerful, gray she-wolf, the mother of a litter of cubs housed in the den yonder. Og had doomed her to death for several laboriously thought out reasons. Gray wolves had been skulking on the edge of the cave village of the Flat Heads lately, harrying the goat herd that Og and Ru, and young Tao had been slowly getting together for Big Tooth and his people. They had been taking toll of young kids, and even older goats. And they had grown bolder, stealing meat from before the doorway of some of the caves, and finally had carried off Crooked Foot's only child. Og and Ru and Tao realized, then, that something must be done about these bold and daring wolves, so stealthy and furtive that it was hard to get within bowshot. As stealthily and as craftily as the wolves themselves the three boys from the Cave People, who were still living with the Flat Heads, hunted the gray marauders, with the result that finally Og jumped a big shaggy fellow out of the thick growth along the river shore, and before the creature could speed away, sent an arrow between his ribs that brought him down in a kicking and savagely snarling heap on the edge of the bush. A skull-crushing blow from a stone axe settled his career. For a time the raids on the village flock ceased, and Og thought that the marauder had been the big gray wolf alone. Then suddenly the inroads on the goat herd began again, and Og concluded that this lone wolf must have had a mate. HE HAD worked out a thought in relation to this she-wolf that interested him beyond the mere desire to exterminate the creature. A long time ago he had acquired two cub wolves, and had trained them almost to the point of domestication. Dogs he called them. He had found them friendly and loyal companions, good hunters and, strangely enough, bitter enemies of their own kind, once they had eaten of his meat and slept beside his fire. Killers though they were, they had a deep sense of loyalty to their human companions. Og had always intended to capture two more wolf cubs when the two he had owned were killed in a fight with a cave bear, but opportunity to acquire other cubs had never presented itself until now. If there was a she-wolf raiding the Flat Heads' goat herd, there might be cubs that made her hunt so hard and develop such boldness. Og decided then to track her down, find her den, kill her and capture her cubs to train as he had trained the others. So he did not give up the hunt, with the result that finally, after much searching, he found her den high up among the rocks back from the edge of the cliffs that overhung the river below the village. Nor did he have to wait long, for as the big, golden disc of a sun began to show its rim above the mountains eastward, sending shafts of glowing light across the river, the silent watcher's quick ear became aware of the soft padding of feet on the stone floor. Instantly his muscles tensed and his bow arm stiffened, while silently he began to draw back his arrow. Before it was to the full a gray shape materialized in the entrance, cast swift but furtive glances about with her slanting yellow eyes, tested the morning wind, which Og was careful to see blew from her to him, then, satisfied that danger lurked nowhere near, opened her great red jaws in a prodigious yawn, displaying long yellow fangs and lolling tongue. As she yawned she reached forward with her big paws and stretched sleepily, raising her head just enough to expose the broad, powerful chest; a clean target. It was the instant Og was waiting for; a sharp strumming sound, a sibilant hiss and a dull thump. With the combination of sounds the she-wolf tensed and tried with lightning swiftness to jump sideways. But even as her muscles gathered strength for the effort the arrow hit her, feathered shaft burying itself to half its length in her body as the flint-tipped point found her heart. The wolf never knew what hit her as she sank to the ground in death. A grim smile of satisfaction crossed Og's face as he stood up behind the boulder. He was impelled to loose a ringing hi-i-i-i-i-yah! of triumph at such a quick kill, and he threw back his head and opened his thick lips as his yell echoed across the morning. He did not realize, as he stepped out from behind the rock, that that yell might reach ears that would not appreciate the glory of his triumphs. SINCE the big gray wolf had been killed, another huge marauder had come to hunt with this female. The mother wolf had accepted his companionship to a limited extent, going with him in quest of a kill and accepting food he brought her, but because she was a mother and had cubs to protect, she refused to allow him in her den or even very near it. He slept higher up among the rocks on a ledge within earshot of the den. And now, while he slept soundly after a long night's run, trouble had come. That ringing hi-i-i-i-i-yah from Og told him that, and with back hairs bristling and a growl rumbling in his hairy chest, he leaped silently to his feet and moved swiftly toward the edge of the ledge, and his big head and glaring yellow eyes looked down toward the den just in time to see the cave boy stepping over the dead form of the mother wolf as he bent low and entered the cave. There were wolf cubs in there. Og knew that the moment he stepped in, for he could hear the soft yapping and baby snarling of several of them as they worried a well-gnawed bone, oblivious of the tragedy that had occurred in front of the cave. The moment they saw Og approaching they gave frightened yelps and scurried to the back of the cave, there to huddle in a frightened, squirming mass as they glared up at him and bared sharp canine teeth with cub ferocity. But Og paid no heed to their show of fierceness as, dropping his bow, he seized one in either hand, and by the scuff of their necks held them up to grin with satisfaction. There were four cubs in the cave, presenting quite a handful, so to speak. Og left his bow lying in the cave and, tucking a cub under either arm and holding one in either hand, turned and started out of the den to get into the daylight where he could see to tie them securely with leather thongs. Stooping low, but still with his broad, tiger-skin clad shoulders scraping the rock, he made for the entrance, little suspecting that just outside, the yellow-eyed embodiment of doom itself waited for him. SILENTLY as a shadow the big he-wolf had come down from the ledge above and padded up to take a sniff at the dead mother wolf after Og had gone into the den. And as the shaggy gray killer realized that the cave boy had been responsible for the death of his erstwhile mate and had moreover gone into the den to kill or capture the wolf cubs she had been protecting, his wrath blazed high, as with mane bristling, he stared malevolently toward the den entrance. It was at that very moment that Og emerged into the daylight. AS OG looked up and beheld the monster wolf with his baleful yellow orbs fixed on him he stopped in his tracks. For one swift, tension-fraught moment he stared at the killer while through his slow brain tumbled surprised thoughts. He was sure he had killed the he-wolf of this pair, yet there he stood snarling at him. For a moment a superstitious fear gripped him. Was this a spirit wolf come back to avenge this killing! Primordial fear of the supernatural made him powerless for a moment to do anything but stand and gape in open-mouthed surprise. But Og, a better thinker than most of his people, had long ago ceased to believe in the supernatural, and swiftly he shook off the spell. Clear thinking told him that this gray fellow was not the wolf he had killed but another he-wolf; a new mate this female had adopted. Moreover, this savage one, bigger even than the first, was fighting mad at the death of the mother, and the fact that he had invaded the den and was stealing the cubs. He meant to fight, and Og realized only just in time that unless he took measures to protect himself, the big wolf, in a single leap, would bury fangs into his throat and kill him. Og was not one to fear any show of fight on the part of an enraged animal. He believed, because of Ak's teaching, that man was the master of any creature, and with a snarl that was as savage as that which echoed from the wolf's throat, he dropped the wolf cubs and reached with one great hand for the stone axe in his girdle. Only just in time did he grasp it and yank it forth when, with a snarl of rage, the great wolf took two quick steps forward and hurled itself savagely through the air, its great jaws open, its eyes blazing with anger. Og was unable to steady himself for a blow with that axe; indeed, he was not even able to raise the heavy weapon to a striking position when the wolf was upon him. The leap was for Og's throat, and those jaws would have assuredly clamped close on his wind-pipe had he not taken a quick backward step and flung up his left arm in a protective attitude. As it was, the teeth crunched shut on his forearm, fangs burying themselves to the bone. At the same time the full weight of the wolf's body combined with the driving force behind that leap, struck the cave boy full in the chest and knocked him staggering backward. For a moment Og fought desperately to keep his feet and swing that short handled stone axe of his. But that was impossible. The weight of the wolf was too much and he went to the ground, the stone axe flying from his grasp as he tried to protect himself in the fall. FOR one terrible instant Og's throat was uncovered as the wolf twisted his left arm down, and with a snarl of rage the creature loosed its hold, and his great head darted in to take a new grip on Og's neck. He would have got that fatal hold, too, had not Og, with a yell of fear, twisted, and hunched his left shoulder to guard this vital spot, and the wolf's teeth, instead of closing in the thick of the boy's neck, clamped fast with teeth set in his heavy shoulder muscle. The wolf must have felt he had the vital hold he was trying for, because just an instant he hung on and wrenched and tore with the weight of his whole body behind the effort. Og realized that if those fangs had been buried in his throat he would have been killed almost instantly. 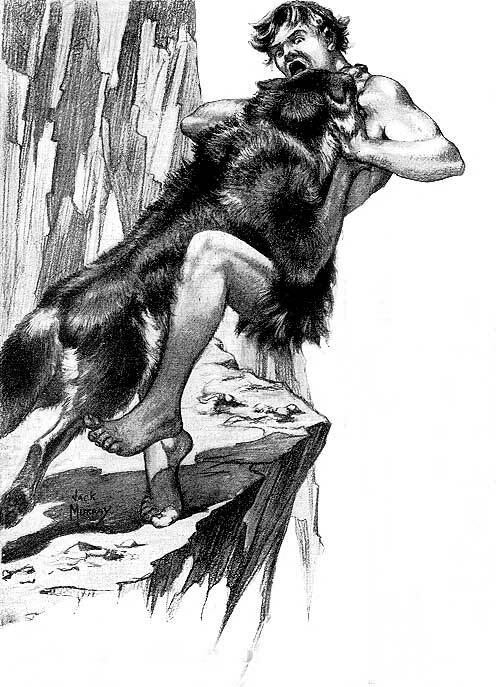 With the wolf clinging fast, the cave boy surged to his feet and, while one hand reached for the animal's throat for a throttling hold, the other felt wildly at his girdle for the flint knife that should have been there. But the flint knife, with his stone axe, lay on the ground, the blade jarred loose from his girdle by the fall. He was weaponless now, with only his two hands to defend himself against the great killer. For some reason this helplessness seemed to make Og suddenly go savage with fury, and his right hand came up with fingers kinked to seize the wolf's hairy throat. The creature by this time realized that he did not have the hold he wanted, and letting go, he half twisted and half threw himself sideways as Og's fingers gripped at, but could not hold, the hairy throat. An instant then boy and wolf stood glaring at each other, both crouched. Og's long arms were bent and big hands were poised in front of him, an instinctive attitude of both defense and offense, while the wolf, his dripping jaws open and his yellow eyes flashing fire crouched low ready for another spring. In the flick of an eye that spring came, the wolf moving so fast that a flash of light might seem slow by comparison. One moment he was crouched tense and ready, the next the tawny form was hurtling through the air straight as an arrow for Og's throat. As fast as Og moved he was no match for the wolf in quickness. His left arm went up to protect his neck, while his right reached for the wolf. But the tawny killer was inside Og's guard before he realized it, and with a cutting snap his teeth closed in the boy's flesh, nor was it flesh of his forearm this time. The teeth met the thick of his neck just where it joined the shoulder, a little too far to the side to sever his wind-pipe, fortunately, but in a bad place. Even in the heat of the battle Og realized that if the wolf's fangs had cut the big artery in the side of his neck he was as good as doomed. Under the impact of the leap, both Og and the wolf went down, and as they struck the ground not one, but both of Og's strong hands closed on the hairy throat of the wolf and clamped fast. Fate turned the tide of the battle. As they rolled around there on the ground, oblivious to any other danger, the action of the encounter was slowly but surely carrying them toward the edge of the cliff, and suddenly, without the least warning, both rolled over the edge, still locked together. Og felt the ground apparently melt away under him, and for an instant he had the strange dizzy feeling of falling through space, but before he fully realized just what had happened, they struck the water of the river with a splash that roared in his ears, and the brown-green water closed over them as they sunk twisting and turning toward the bottom, amid a whirl of silvery bubbles that floated upward. Deeper and deeper they sank to the very mud of the bottom, still fighting. But fear of the water was instilled deeper in the wolf than it was in Og, and after they had been under for a few moments the creature loosed his grip on Og's neck and began to battle to get free. But Og, with victory in sight, would not let him go. Harder he gripped the creature's throat and deeper he sunk his strong fingers, while the wolf twisted and turned and ripped Og's chest and forearms open with his sharp claws as he tried to get free. Og lost all sense of time and everything else as he struggled there under the water, slowly but surely throttling the wolf. Indeed, by the time the animal's fierce struggles grew less and he knew that death was claiming the creature, he realized also that he himself was well-nigh spent. It was fortunate indeed that they were both on the way up to the surface then, for Og knew that he could not remain much longer without a breath of fresh air. The blood was pounding in his neck and temples, his lungs ached, and a strange weakness was coming over him, a weakness that made it difficult to raise his head as it broke the surface and gasp painfully for much-needed breath. For a moment he floundered about helplessly up there on top, still clinging fast to the wolf, but painfully aware of the fact that he was going under again and that he was unable to help himself. Indeed, he started down toward the bottom again, his mind strangely blurred and only semi-conscious when suddenly a dark shape seemed to take form above him, while a long arm reached down into the water and strong fingers closed into his hair. In the same dazed state he knew that somehow, in some strange way, he was being dragged out of the river by the hair of his head, and the wolf, because he still clung fast to it, was being dragged out also. It was some time before he realized fully that he was in the bottom of the dugout canoe in which Ru and Tao and Big Tooth had gone fishing that morning. On the river when he and the wolf had come tumbling over the edge of the cliff, they had seen him fall, and had hurried to his rescue, dragging him out only just in time. The strangled wolf was in the canoe, too, which pleased Og because he wanted that creature's pelt. But more than that he wanted the four wolf cubs he had been forced to abandon when the fight began, and it did not take much effort on his part to persuade Ru and Tao and Big Tooth to paddle ashore and climb the cliffs to the den. There they found the young wolves huddled around their dead mother in the cave entrance, and triumphantly each took one back to the cave village, there to train the animals as Og said they could be trained, making of them the first dogs to share the camp fires of their human companions.